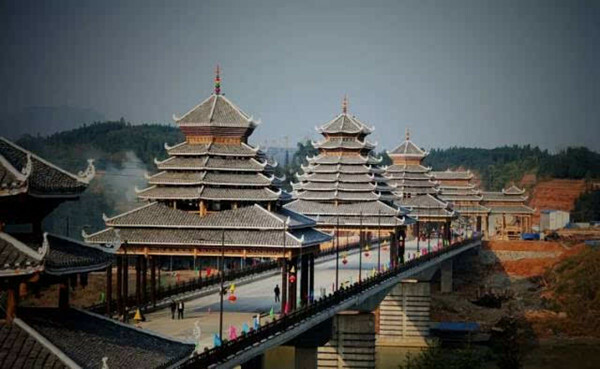 Before we into the main body part, please allow me to introduce a mysteryious county – Sanjiang Dong Autonomous County, where is situated at the border areas of Hunan, Guizhou and Guangxi provinces. In the areas along the rivers and brooks, the folk buildings of the Dong nationality could be observed, which are wooden houses with abundant ethnic features absorbed inside. 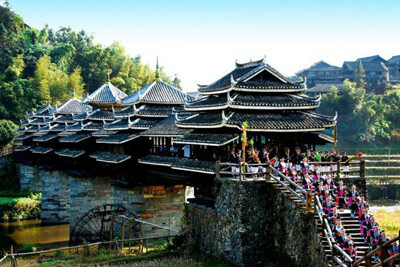 These buildings are also rich in the Dong traditional folk culture and characterized by a strong shroud of mystery, as a result, they are very attractive to visitors. 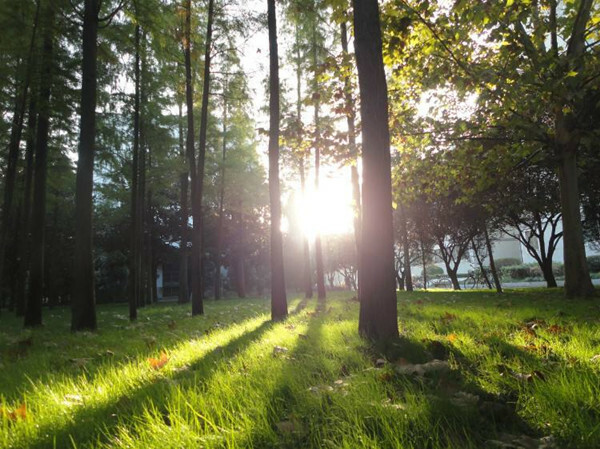 Sanjiang County is situated in low latitude area, which has a subtropical and humid climate. The annual average temperature is between 17 to 19 degrees. Rains and hot weather are usually existing at the same time and there are distinct summer and winter here. In the dawn and dusk, there are always fogs and all through the four seasons of the year the climate is good enough to do farm work. In spring, there are often cold and rainy drizzle days, in summer there are mostly heavy rains and high temperatures, in autumn it is quite often to have draught and in winter there are frost sometimes. Spring begins from middle March and ends in middle May, then comes the hot sumer , autumn comes at late September, and from the beginning of December to March next year is cold winter. During the year, the coldest time comes in January with an average temperature of 7.1 degrees and the hottest time is in July with an average temperature of 27.4 degrees. The topography of Sanjiang County is characterized by mainly low hills and downlands, and vast mountains and hills are also widely distributed , winding fluctuantly in this area. The main inhabitants here are the Dong ethnic group, who account for 53.6 percent of the local population. As the Dong people are characterized by their strong and unique ethnic features in aspects of food, clothing , housing and transportation and there are imposing and splendid natural sceneries as well as abundant and colorful traditional festivals here, Sanjiang County has become a hot tourism destination for visitors to enjoy and appreciate the unique ethnic culture and beautiful natural scenery in the middle part of Guangxi Zhuang Autonomous Region. 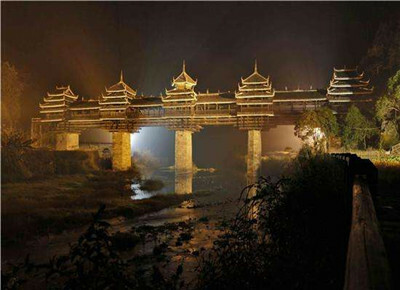 As soon as arriving in this county which is under the jurisdiction of Liuzhou City, visitors can not only immediately feel the strong and peculiar Dong ethnic folk culture, but also the unique and universally acclaimed architectural art here. Whenever walking into a Dong ethnic village, the first things coming into sight are the Wind and Rain Bridges and drum towers, which are well known for their unique architectural styles, exquisite structures and imposing and splendid appearances. Drum towers are architectures of the Dong people with very unique styles, and they are widely distributed in the border areas of Hunan, Guizhou and Guangxi provinces. Tall drum towers stand in the Dong villages, looking quite imposing and splendid. From the bottom to the top, decorated by sagging eaves , there are many steps leading to the top , just like a big tower. On the tiles and eaves, there are colorful paintings and carvings of mountains, rivers, flowers, dragons , phoenix , birds , and people clad in ancient clothes scattered in clouds and mists , creating a very colorful and imposing atmosphere. 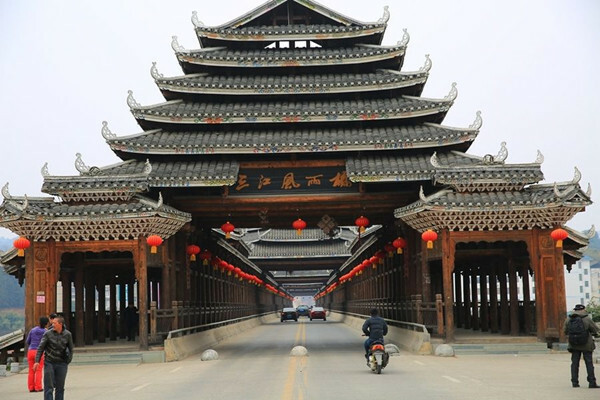 The drum tower in Gaozeng Dong Village of Congjiang County Guizhou Province is more than 20 meters high , with 13 storeys. In Jintang Dong village of Liping County Guizhou Province, there are three drum towers in one single village, which is very unique and creates a magnificent atmosphere. What Time did the Dong People Begin to Build Drum Towers? As there are no written records of this, the answer is still unknown. However, the Dong people have been told from generation to generation that there have been drum towers ever since the construction of Dong villages in ancient times. 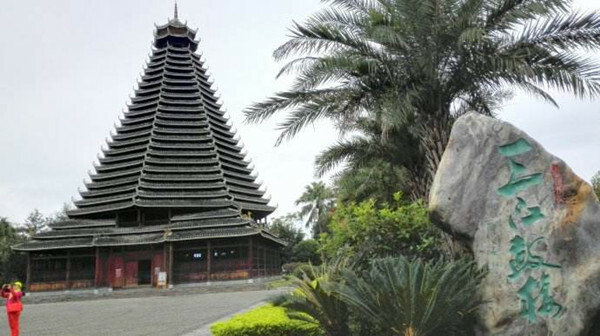 According to historical records from the reign of Emperor Yongzheng in the Qing Dynasty(1644AD-1911AD), the Dong people at that time put big pieces of woods in the grounds as the base and then constructed high towers, and the singers slept inside at night. From this we conclude that there have been drum towers from as early as the end of the Ming Dynasty(1368-1644) and the beginning of the Qing Dynasty. From ancient times, the Dong people have always been densely inhabited in different villages, the biggest one of which includes more than one thousand families, and in the smaller ones, there are thirty to fifty families. The drum towers are usually constructed by families with the same family names, that means that there could be several drum towers in one single village if there are different groups of families here sharing different family names. The Jitang Dong village mentioned above is one such example, which is very common in the Dong villages. The building materials of the drum tower are the woods of firs. There is the main column in the center of the tower, and different parts are strongly connected with each other . People can get to the stop by the steps. The drum towers all have complete wooden structures , no nails are used here. However, the whole structure is very strong and could stand there for hundreds of years without leaning or rotting. The exquisite and excellent architectural techniques of the Dong artisans are vividly embodied by the drum towers. The main column and the woods of other important parts are chosen by the prestigious and respectable seniors among the Dong people. Only those trees which are with good quality woods, bulky, tall, and old could be used as building materials of the drum towers. The woods which have been chosen by the seniors are marked with signs, and those without signs cannot be used. As a result, the tree which provides the marked woods is considered to be the king of all fir trees. Judging from the meaning of the name, it is believed that the Dong people in ancient time built drum towers in order to place their drums inside. Therefore in the Dong villages where there was a tower, there was always a drum inside, and where there was a drum, there must be a tower constructed for the drum. As time went on, people just called this structure drum tower. The drums inside the towers are usually made from birch woods, as a result there comes the nickname birch drum. The drum is always placed at the top of the tower. In the history of the Dong nationality, whenever there were important events needing to be discussed , agreements needing to be reached, invading enemies needing to be beat back, the Dong people hit the drum to assemble all the villagers. The drum was always hit by the leader of the village . When hearing the sounds of the drum, all villagers gathered together in a very short time. At normal times, people were usually not allowed to climb the drum tower if there were no important events. 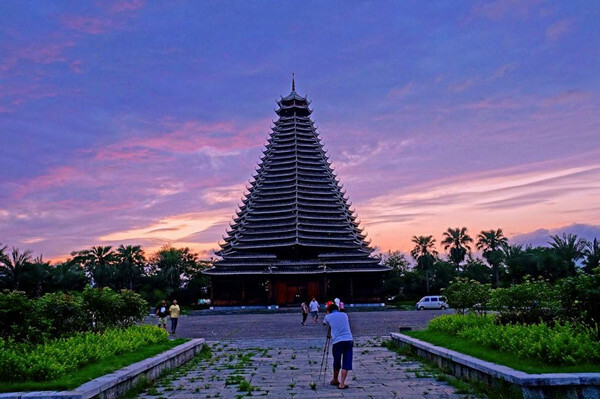 The bottom part of the drum tower is in a square shape, with long benches surrounding the building, and a fire pit is placed in the central part.In front of the entrance, it is the place to celebrate the new year and other important festivals of the Dong nationality. In summer when it is very hot, all the villagers including men and women, young and old, come to the drum tower , chatting with each other in the shade. In cold winters, they come to sit around the fire pit, sing songs, play musical instruments, and share interesting stories. The Dong people have the custom of sitting on the benches of the drum tower, especially during the Spring Festival, in each of the Dong village, all people gather together at the square in front of the drum tower, singing songs accompanied by playing their own unique instrument Lusheng ,which is a reed-pipe wind instrument. Also they perform their own operas, the contents of which are based on the traditional folk legends and stories of the Dong nationality. The drum tower is also the place where the old people teach songs, the young people sing songs,the children learn songs, and the old artists teach and make operas. The Dong villages are always well known as the Sea of Songs, which is quite reasonable. Their songs not only have very beautiful and attractive melodies, but also have very compact and inseparate contents. There are various forms when singing, especially there are harmonious singing styles combined together when different people sing together, which is very unique and special among all the ethnic groups in China. The Dong operas have been developed on the basis of songs and it is widely loved by the Dong people. The local Dong people like to make their special oil-tea, which is the inevitable food at all the three meals a day in some Dong families. When making it, the Dong people first boil the oil-tea leaves with different seasonings in water, then filter out the leaves and put the main food inside before eating it. The food could be anything, such as raw rice, noodles made from rice and fried rice, and so on. Anything that could be eaten by human beings could be put into the boiled oil-tea as the main food. There is also another kind of food which is called sour fish, and it is quite delicious. However, not everybody can get accustomed to its special flavor. Usually the oil-tea is eaten at breakfast, and sticky rice food and peanuts are often put into the oil-tea to make it more delicious. 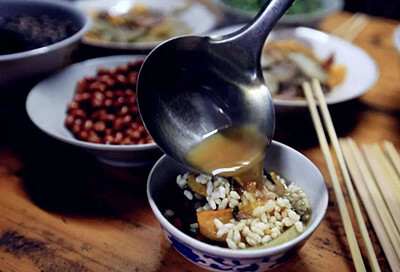 As the popular saying goes that the Dong people cannot live without sour food, they love to eat sour dishes very much, which mainly include sour fish, sour meat, sour ducks, sour vegetables, etc. All of these are very important dishes for the Dong people to treat their distinguished guests. 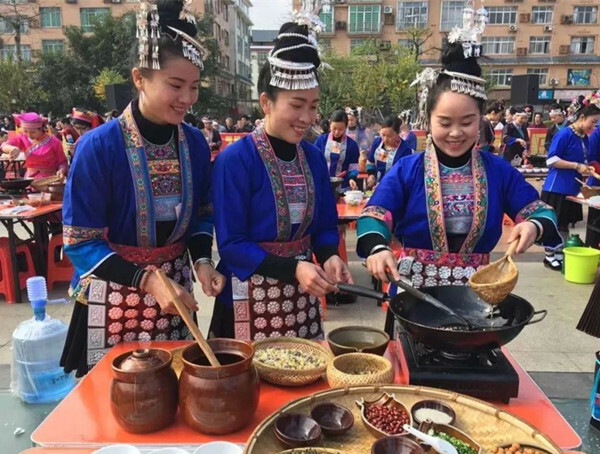 If the host like the guest very much, the first meal in the Dong family to treat the guest will be the above-mentioned sour dishes , in the meanwhile, the self-made sweet wines are also served, which is their own special way of welcoming the distinguished guests. In fact, the flavors of sour dishes are very special, especially the dish of raw fish, and there is no such food in any other places of China. The Dong dishes all have very strong taste, however, most visitors can get used to it and they will never forget the special flavor of the Dong food in their future life.